"CRÈPERIE – Ici, les crêpes et galettes ont gardé toute leur authenticité. 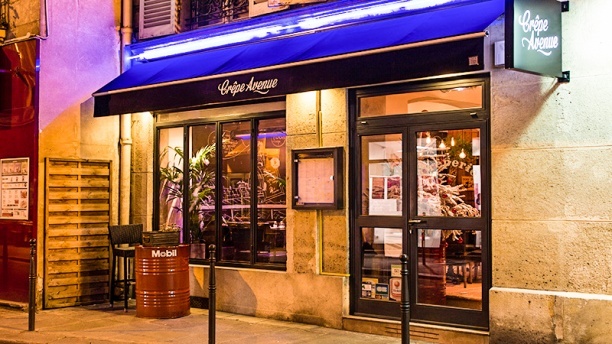 Au restaurant Crêpe Avenue, les crêpes sont généreusement garnies - vaste choix de garnitures, fromage, viande ou produits de la mer - les recettes originales, et l’accueil irréprochable. Une très bonne adresse dans ce 8ème arrondissement de Paris. SUGGESTIONS – Les galettes plat du jour du restaurant Crêpe Avenue comme la galette Fajitas: poulet, poivrons, oignons cuits au cidre, tomates, crème fraîche, épices et accompagnement riz au maïs ou la galette grecque : salade feta, concombre, poivrons"
Galettes correctes mais manquant de sarrasin et servies sans salade. Quality of food was adequate, although filling portion was small. Waited 15 minutes after ordering desert crepe and it never arrived. We had to leave for a concert and never were able to finish our dinner. Would not return. I had a lovely meal at Crepe Avenue while traveling to Paris on business. The food was exquisite - piping hot, fresh ingredients, and inspired flavor combinations. The servers were attentive and friendly without being hovering, and were able to humor me while I spoke (terrible) French. I wish I had another evening this trip to go back, as there were many items on the menu I would have liked to try. The value is also great for the money - I believe my two crepes (savory and sweet) and a small carafe of wine were less than 25 euros. There are a lot of restaurants in the area that charge a fortune for mediocre food - avoid them and come to Crepe Avenue instead! You'll be glad you did. The crepe is well made and many varieties while stay in Paris may try again! Very welcoming and friendly place. Wide variety of crepes and all was very fresh and well prepared. Only critique was a limited wine list, but overall for delicious crepes in Paris, this is a great choice at an excellent value. Good food, prompt service, friendly, and very reasonably priced. Very enjoyable. The server was terrific. Good location, nice atmosphere and pleasant service. very good selection of crepes, family friendly place and a true Parisian atmosphere! the Mexican crepe was our favourite!